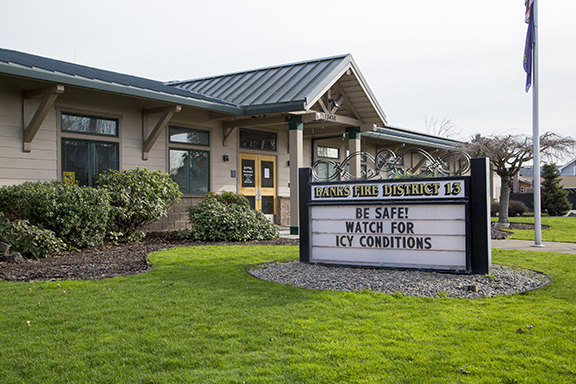 Winter Weather Advisory for NW Oregon from Friday evening to Saturday night | Banks Post | Local news from Banks, Buxton, Manning, Roy, and Timber. The National Weather Service has enacted a Winter Weather Advisory from 6 p.m. Friday to 8 p.m. Saturday, February 8 and 9. Forecasts call for 3 - 7 inches in Coast Range communities: Vernonia, Trask, Timber, Jewell, Lees Camp, Sunset Summit, elsewhere could see 2 - 4 inches, with snow seeing more accumulation at higher elevations. The Banks Fire District. Photo by Brenda Schaffer. NW OREGON - "Plan on snow and ice covered roads tonight and Saturday." That's the message in a Winter Weather Advisory issued by the Portland branch of the National Weather Service (NWS) for much of NW Oregon, calling for anywhere from 2 - 4 inches of snow on the valley floor to 4 - 7 inches at higher elevations in the Coast Range from Friday evening to Saturday night. According to the Portland NWS, the forecast could see temperatures drop below freezing during the evening commute, with snow starting to fall around 7 p.m. Friday and continuing until 4 p.m. on Saturday. The Portland NWS calls for caution while driving and warns of low visibility during expected snowfall. The weather forecast has already resulted in a host of closures, including a movie night at the Banks Public Library that had been scheduled for Friday evening, the Teen Service Saturday event, and more. Check our list of closures, which will be updated throughout the weekend here. Want to share your snow photos? Email them, with names of anyone pictured and the name of the photographer, to news@bankspost.com.